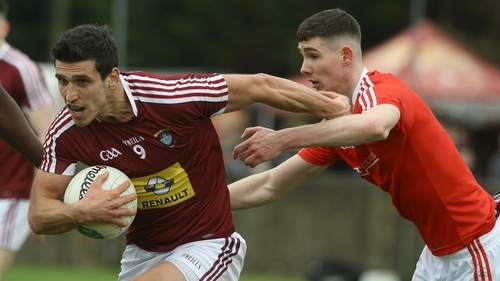 A share of the spoils was enough for Westmeath to claim promotion over Louth in this pulsating re-fixed Division 3 clash in the Gaelic Grounds in Drogheda. As expected, with promotion on offer, the game went right down to the wire. John Heslin gave Westmeath the slender lead before Louth substitute Ryan Burns levelled the game to no avail for the wee county as they needed victory on the day. Some huge defensive stops in the second half laid the foundations for Westmeath’s passage to Division 2. Ger Egan profited on the back of these numerous counter attacks, his goal from the penalty spot early in the second period proved the tonic to edge the battle from promotion. Louth on the back of a stellar away victory to Down last week started the game with all that confidence. Louth centre forward Ciaran Downey surged for two opening points of high quality illustrating the surge. Westmeath settled and on the back of some stout defending levelled the game. Luke Loughlin a late starter to their team opened the visitors account while Ger Egan landed a free. Louth edging the contest at this stage took the lead with a mark through in form Downey. With so much at stake, the game tensed, both sets of players retreating behind their defensive lines. Sam Duncan did force an opening to level the game for the second time, but the game overall drifted into a lull of caution. Bevan Duffy snapped the game back into consciousness with a superb goal. The centre back strode up the field with play a one-two with Downey to bury a low shot to the bottom left corner. The tight opening stanza belonged to Louth and the hosts deservedly went in with their noses in front, 1-04 to 0-05 at the turn. The second half began with Westmeath catching Louth napping. A huge turnover in the centre of the pitch opened the field up for the Lake county to exploit and exploit they did. The counter attack forced Louth full back to foul John Heslin for a crucial penalty. Egan dispatched with ease to give Westmeath the lead for the first time in the game. That lead was short lived as Louth wing forward Jim McEneaney found the target himself from the spot. However, that was as good as it got for the home side with Westmeath pointing three in a row to wrestle back the momentum. Corner back James Craven did come up the field to level for Louth, but indiscipline again caught up with Wayne Kierans side as Tommy Durnin was red carded in the final minutes to make Louth’s search for a win all the more difficult. John Heslin, quiet throughout, came up trumps to take advantage with a sublime score to give Westmeath the precious lead and more importantly the cushion of a one-point buffer. Knowing that a draw would suffice, the point was needed as Louth pushed for the victory but the trusty Westmeath rearguard held out for a draw and a place in the Division three league final versus Laois next Saturday. Louth: Fergal Sheekey; Fergal Donohoe, Emmet Carolan, James Craven (0-01); Anthony Williams, Bevan Duffy (1-00), John Clutterbuck; Tommy Durnin, James Califf (0-01); Jim McEneaney (1-00, 1-00 pen), Ciaran Downey (0-03, 0-01m), Conor Branigan; Andy McDonnell, Sam Mulroy (0-01, 0-01f), Declan Byrne. Subs used: Ryan Burns (0-01) for D Byrne (44); Eoghan Duffy for A McDonnell (49); Conor Early for J Califf (54); Ross Nally for S Mulroy (59); Conall McKeever for J McEneaney (61). Westmeath: Eoin Carberry; Ronan Wallace,Kevin Maguire, Boidu Sayeh; James Dolan, Frank Boyle, Killian Daly; Denis Corroon (0-01), Sam Duncan (0-01);Jack Smith,Ger Egan (1-04, 0-04f, 1-00pen) Ronan O’Toole; Kieran Martin, John Heslin (0-01), Luke Loughlin (0-03). Subs used: Noel Mulligan for J Smith (31); Joe Halligan for L Loughlin (63).